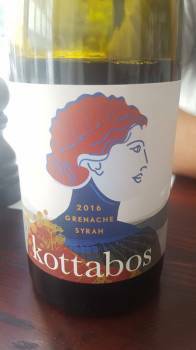 Reenen Borman of Boschkloof, seemingly uncontainable when it comes to new winemaking ventures, has just released Kottabos 2016, the name referring to an ancient Greek drinking game, the wine consisting of 87% Grenache and 13% Syrah from the Polkadraai area of Stellenbosch (price: R195 a bottle). Both components underwent 50% whole-bunch fermentation, maturation lasting 11 months in older oak. A captivating nose of pomegranate, candy floss, earth and spice while the palate is light and fresh yet very flavourful, the tannins fine and supple. Super stuff!